Beets are a tasty low-calorie vegetable, have lots of fiber, and are chock full of nutrients including vitamin B, iron, manganese, copper, and magnesium. But I often struggle to find good beet recipes. 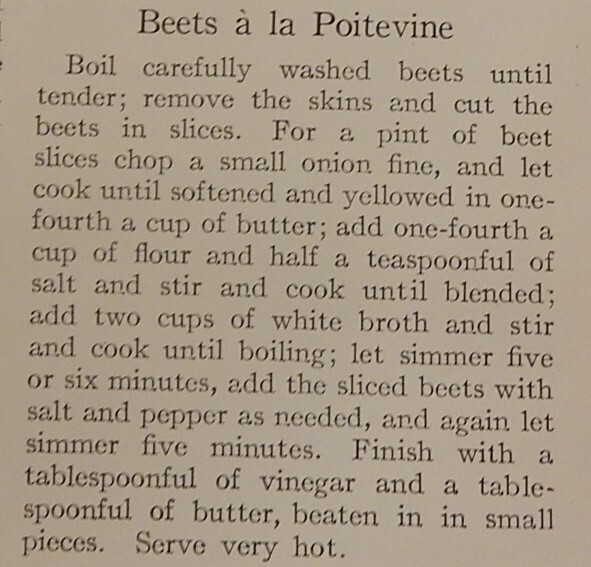 So I was thrilled to find a hundred-year-old recipe for Beets a la Poitevine. Beet slices are immersed in a light sauce that brings out the natural sweet goodness of the beets. 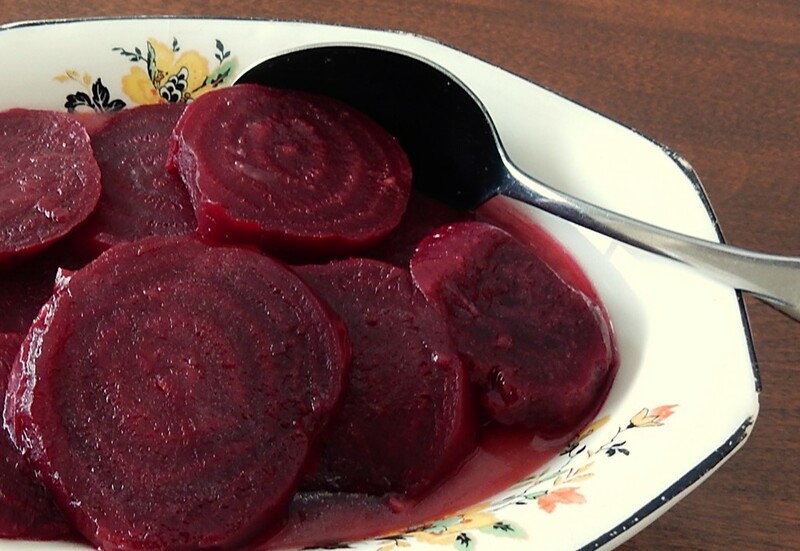 At first I thought that this recipe might be similar to Harvard Beets – but it is very different. The recipe calls for no sugar, and only a minimal amount of vinegar which I could barely taste. I was curious about the French name of this recipe, and googled it but didn’t come up with much. Poitevine may refer to a place in France. There is a village called Bussière-Poitevine in central France. Wash and trim beets. Place in a large saucepan and cover with water; add 2 tablespoons vinegar to reduce bleeding. Bring to a boil using high heat, then reduce temperature and simmer until the beets are tender (approximately 30 – 45 minutes, depending upon size). Remove from heat, drain, and cool slightly, then peel beets. The skin is easy to remove after cooking. Slice the peeled beets. In the meantime melt butter in a saucepan, then add diced onion and saute until tender. Stir in the flour and salt; then gradually, add the chicken broth while stirring constantly. Add 1 tablespoon vinegar. Continue stirring until the sauce boils and thickens. Gently stir in the sliced beets, and cook until hot and bubbly while gently stirring. Remove from heat and serve. The original recipe called for adding additional butter as well as the vinegar at the very end of the cooking process. This seemed unnecessary to me – so I added all the sauce ingredients prior to adding the beet slices. After I added the beets, I just cooked it until the sauce returned to a boil and the beets were hot. 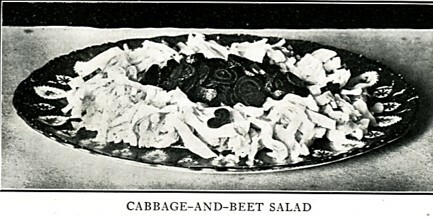 Sometimes salads can seem a bit boring, so I was delighted to find a hundred-year-old recipe for Cabbage and Beet Salad. This salad makes a lovely presentation that is just a tad dramatic. And, a subtle homemade French dressing adds just the right amount of flavor to the salad. 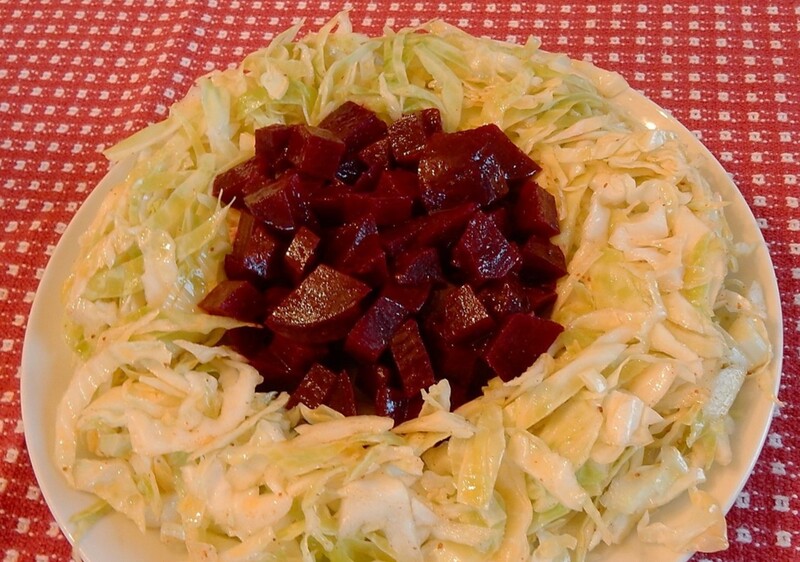 Put shredded cabbage in a bowl; gently stir in 2/3 of the French dressing. Put in refrigerator, and chill for at least 2 hours. Put diced beets in another bowl; gently stir in 1/3 of the French dressing. Put in refrigerator, and chill for at least 2 hours. 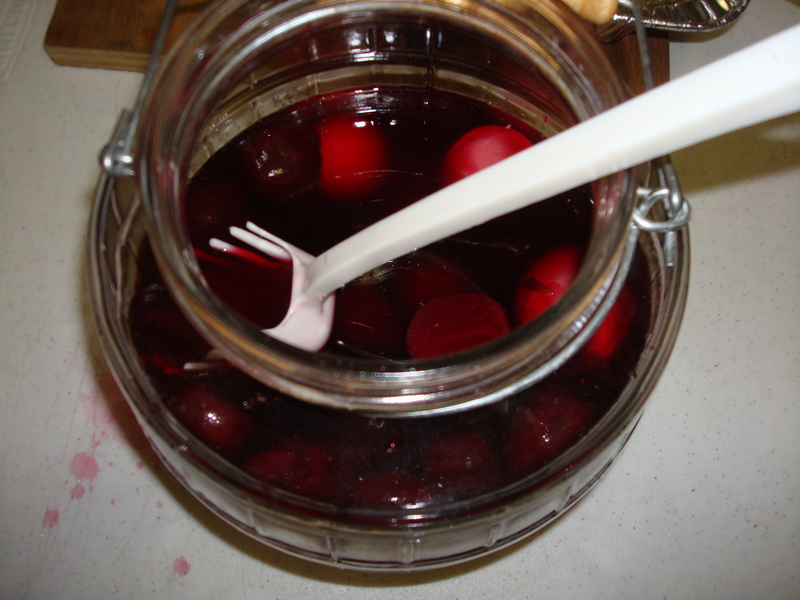 Drain any excess liquid from the beets. Place beets in the center of the ring. Serve immediately. To make French Dressing: Put olive oil, vinegar, salt, mustard, and paprika in a small bowl; stir to combine. Stir in minced onion. I’m always on the outlook for salads and relishes that use seasonal ingredients. 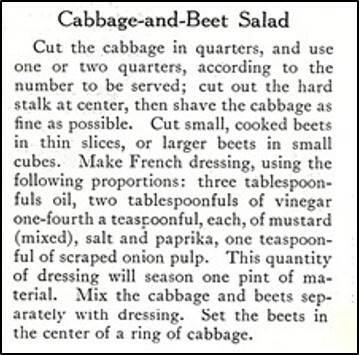 When browsing through the January, 1916 issue of Good Housekeeping, I came across an intriguing recipe for Beet Relish. Of course, I had to try it. 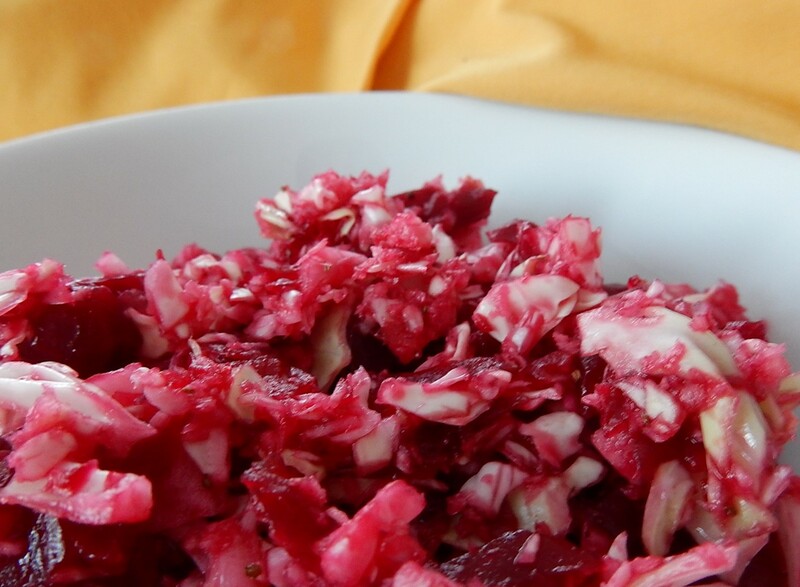 The Beet Relish contains chopped beets and cabbage in a tangy vinegar dressing that has a fun horseradish kick. This recipe makes an absolutely beautiful, slightly flashy, sweet- sour side dish. Combine sugar, vinegar, salt, dry mustard, and celery seed in a bowl. Add chopped beets and chopped cabbage; stir to combine. Add horseradish to taste. Refrigerate for at least 24 hours before serving. Will keep in the refrigerator for several weeks. I halved the recipe when I made it. I also used much less horseradish than called for in the original recipe. A little horseradish adds a nice peppery flavor to this dish–but too much can easily overwhelm the other flavors.